I find myself frequenting buffets less as each year passes by. I'm quite aware of my body's limits as I slowly make that shift away from my 20s and a combination of a gradually slowing metabolism and shrinking stomach capacity makes me less keen on visiting AYCE places. Although buffets may have been the setting for memorable eating contests with friends in my teenage years, now I'm proud if I can finish three plates without having to be hauled out or have my stomach rebel against me the same night. In Korea though, buffets carry all the connotations of a luxury establishment, making buffets somewhere you're likely to visit more as you get older. Taking your girlfriend out for an anniversary date, celebrating the birthday of one of your parents or holding a business meeting at a buffet is not only perfectly fine but even considered an impressive effort on the one treating. There's a long range of buffets in Korea all categorized from low to mid to high tier (and price tag) but the pinnacle of it all are undoubtedly hotel buffets. Hotel buffets in Korea are not only all exorbitantly priced but will inevitably hold all the ingredients, dishes and whatnot the average Korean regards as luxurious. 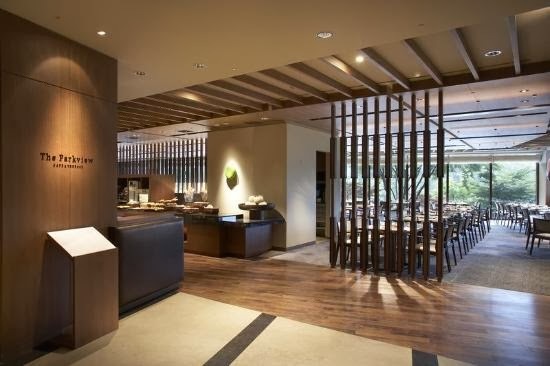 Shilla is a crown jewel among hotels and its buffet is the most exorbitant among its peers at 100,000 won a person for dinner (regardless weekday or weekend). I had the opportunity to check it out recently (my second time going) and here are a few pictures and commentaries on my dinner. The Parkview splits its dinner times into two blocks: 5:30 PM~ 7:30 PM and then from 8:00 PM~ 10:00 PM. After being shown to your table (reservations in advance help to get good seatings) a server will promptly come and pour you water (imported bottles from Europe no less) and let you know you're free to begin right away. The buffet is more or less divided into the following zones: Italian/steak, salads and produce, seafood and sushi, Chinese, dim sum, a noodle station, and desserts/fresh fruit and coffee. I began around the salad section which was stocked with some very fine salads and produce. Proper Caesar salads with real romaine, anchovies and fresh parmesan and pine nuts on the side were available as were various salads with quinoa, lentil, asparagus, various mushroom, eggplants and whatnot. What sets The Parkview at the Shilla apart from other buffets is the attention to little details and ingredients. On hand for your own use are not only imported olive oils but oils made of avocado, truffle, etc. The tomatoes in the caprese salad were so juicy, sweet and fresh and I might go as far as to say they were some of the best I've had in Korea. The seafood section was also splendid with standout items including jumbo shrimps marinated in a cilantro vinaigrette-like dressing, salmon and of course, king crab legs. Unlike many buffets in the states, the king crab legs come whole which is a minor annoyance to deal with but perhaps a good idea lest the hordes of customers overdo on the crab legs. In addition to a number of fresh sashimi offered (including 2-3 different cuts of tuna! ), around the corner and next to the king crab legs, were a pair of sushi chefs who made fresh sushi on plates with customers backed up around the corner. They really deserve praise for their nonstop hard work! The sushi, like the sashimi, came gleaming and perfectly fresh, once more reflecting Shilla's commitment to high quality ingredients. and your spoon will soon be enveloped in the creamy truffle soup. The soup was nice enough with its truffle hints and bits of mushrooms at the bottom but nothing memorable. I left most of the soup but I (guiltily) ate most of the top of the buttery, croissant-like pastry. Moving on, I took my next plate mostly from the Italian and the meat section as well as a few items from here and there. The pasta dishes were definitely misses. The ravioli was very dry as was the spinach lasagna roll-up. The escargot and mushrooms were flavorful and pleasant to eat. The foie gras was pleasantly fatty and accompanying pumpkin(?) sauce well matched. But with the steaks and other meats, it definitely got a little too rich towards the end for me. The lobster tails were cooked just right so they had a nice texture without getting chewy. The sauce it was basted in had a nice kick without overcoming the sweet lobster meat. If I remember correctly though, long ago they used to serve whole lobsters that were split in half but now the lobsters are cut up even further. The filet mignon were grilled nicely to a just-right medium rare. It's surprisingly difficult to find places in Korea that do steaks medium-rare justice but The Parkview does it well. Also available were lamb chops which I didn't partake in this time but the others with me said was great. The build-your-own noodle station had an option between pho and jjajangmyung. I chose the pho and was very disappointed. But then again, we can't have it all, can we? Skip the pho. Shilla's dessert corner is also the best I've seen among buffets in Korea. Shilla's line of bakery and baked goods is already lauded as being one of the best and their dessert corner (for the most part) reflects it with pretty good cheesecake and other cakes and pastries offered. They also do a mini chocolate souffle which they bake fresh in an oven before dishing out. Rich, chocolatey and gooey inside, these are extremely popular. A barista is also on hand to offer out fresh made espresso, latte, etc. If looking for something light, the fruit section has pineapples, grapefruit, grapes, gold kiwis and more and the fruits are all fresh and high quality. This recent second visit confirmed for me that The Parkview is the best buffet in Seoul, if not all of Korea. Now, I say best meaning best overall for quality and taste but not for best value. Drinks aren't even included in the 100K won price tag per person so cracking open a bottle of wine in addition to your meal will only up the sizable dent The Parkview is making on your wallet. For a dinner-only price of 100,000 won per head I would opt to go with a higher-end restaurant for special occasions. Parking: Valet parking (not free unless staying at the hotel or special card holder) and regular parking on the hill available. But parking on the hill lot is usually always full. Tip: Breakfast and brunch times are a little cheaper but still very expensive. Breakfast is 59,000 per adult while brunch is 93,000 on weekdays and 96,000 on weekends. For children (3 years to 13 years old) the prices are 32,000 for breakfast, 55,000 for brunch and 59,000 for dinner. Excellent pictures. Thanks for the report.